Osteochondritis dissecans is a problem that affects mainly young athletes, but occasionally the residual effects of an osteochondritis dissecans lesion can be seen in an adult. An OCD lesion involves the bone under the articular cartilage in part of the knee (almost always the lateral aspect of the medial femoral condyle) starting to die. 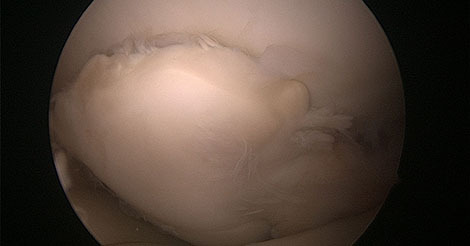 Early on the cartilage over this diseased bone is intact, but it can later break off with the underlying bone and float freely within the knee joint. What is osteochondritis dissecans, or an OCD lesion? Osteochondritis dissecans typically affects athletes from approximately age 10-15. Early in the disease process, the main complaints are dull pain or soreness and swelling. Often an athlete will notice swelling without much pain at all. Once the cartilage and/or bone breaks free, he or she often complains of clicking, catching, or even locking of the knee joint. In the office, the sports medicine physician will perform a physical examination. Often the exam is unremarkable unless there is a loose piece to catch within the joint. Sometimes provocative maneuvers can reproduce the athlete’s pain. X-rays almost always show this lesion. Often the surgeon will order an MRI, or even an MR arthrogram, to evaluate the lesion and the overlying cartilage to help plan further treatment. In young athletes who are not finished growing, there is often a good chance that the lesion will heal on its own. Treatment in this situation often involves making the athlete nonweightbearing for many weeks to try to decrease stress on the lesion. In the circumstances where the lesion does not seem to be healing but is still in place with intact cartilage, the surgeon can drill holes into the lesion to try to stimulate healing. 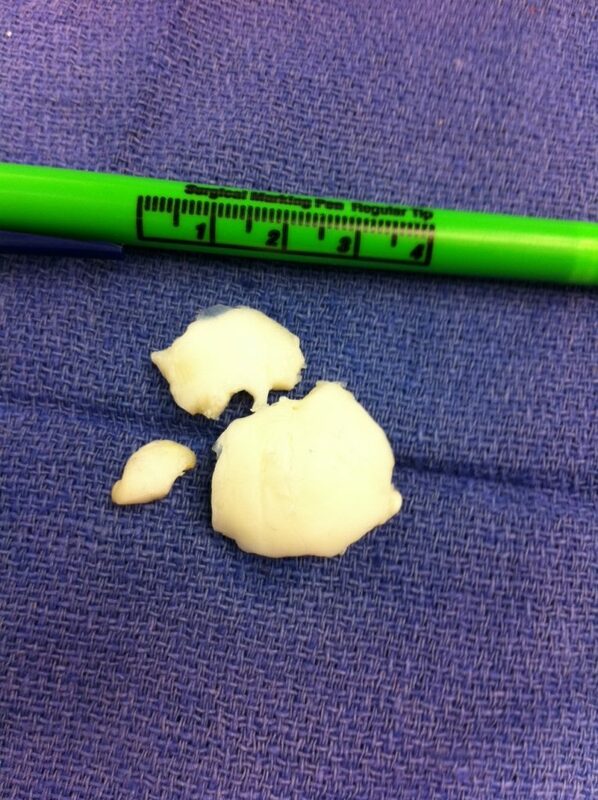 If the lesion has broken away, nonsurgical treatment is not indicated. Surgery to try to put the lesion back in place and hold it with screws or pins can occasionally be attempted successfully. Other times it is a free-floating piece of bone and cartilage that is removed and filled with cylinders of bone and cartilage from the athlete’s knee or from a donor. Return to sports can be variable depending on the type of osteochondritis dissecans lesion and the treatment. Usually return to sports is not possible until the lesion has healed. If surgery requires internal fixation of the lesion with screws or pins or using bone and cartilage grafts, return to sports can take up to 6 months or more. This large piece was removed from a young patient who will need a second surgery to fill the defect with a cylinder of bone and cartilage from a donor. Notice that the fragment measures over 3 cm.